Parts Depot - Restaurant Equipment Commercial Appliance Parts NYC | Parts Depot Inc. When important restaurant equipment breaks down, Parts Depot is there to help. Since 1995, we’ve been proudly providing restaurant owners with OEM and aftermarket replacement parts throughout New York, New Jersey, Pennsylvania and Connecticut. From ovens to grills and more, we can provide your company with the necessary restaurant parts it needs to keep operations running smoothly. When you buy from Parts Depot, you’re purchasing parts from a family-owned and operated business that is dedicated to customer service and satisfaction. We have a large inventory of kitchen equipment and other restaurant parts readily in stock, allowing our clients to get ahold of new parts quickly and conveniently. We also provide fast delivery to our clients along with competitive pricing on all our aftermarket restaurant parts. We also carry a comprehensive line of manufacturer-specific parts for all your commercial appliance needs. Regardless of whether your kitchen equipment is from Garland, Blodgett, Southbend, or another major manufacturer, Parts Depot has you covered. We carry OEM parts for over a dozen different major restaurant equipment brands in addition to a large variety of quality aftermarket items. By working to satisfying customer demands and offering an extensive selection of restaurant parts, Parts Depot is your one-stop shop for restaurant part replacement. Our customers are family to us, and we want to do all we can to keep them happy. 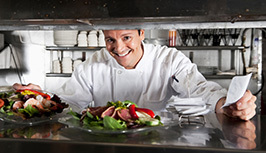 Learn how we can help your business replace vital restaurant parts!